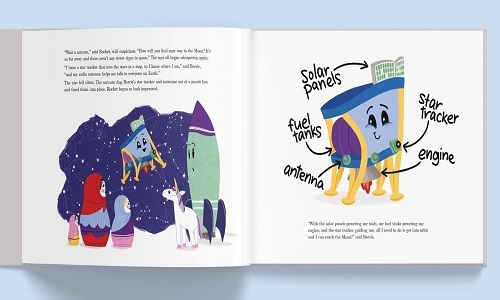 SpaceIL wants to inspire kids to dream big and learn about space exploration with this tale based on its upcoming lunar mission. Israeli nonprofit organization SpaceIL is launching Israel’s first unmanned aircraft to the moon in early 2019, and is using the occasion to inspire children on Planet Earth. The Little Spacecraft tells the story of Berrie, a toy spacecraft based on SpaceIL’s real spacecraft, Beresheet (Genesis). Berrie dreams of going to the moon, but the other toys believe she is too small for such a big dream. Berrie explains to her friends how each of her special tools is designed to help her accomplish her mission. The story is of course analogous to SpaceIL’s mission of achieving an Israeli lunar landing, an endeavor historically carried out only by the world’s superpowers. Should SpaceIL’s mission prove successful, Israel will join the big league of space exploration. Set to take off from Cape Canaveral in Florida in the first quarter of 2019, Beresheet should reach the moon at the end of a two-month journey. SpaceIL was established in 2011 by three young engineers who decided to take part in the Google Lunar XPRIZE challenge to build, launch and land an unmanned spacecraft on the Moon. Although the competition was aborted in March 2018, SpaceIL decided to see through its mission anyway. One of the organization’s goals is to inspire the next generation to become interested in aerospace engineering and space exploration. 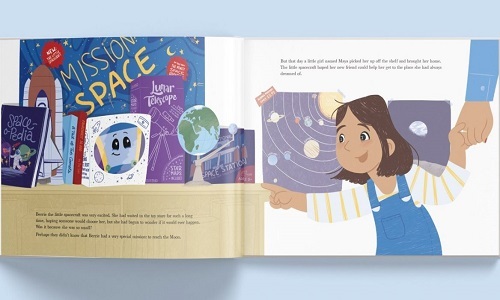 To this end, SpaceIL teamed up with Israeli multimedia company StellarNova, which produces toys, books, videos and science experiments to encourage children to get involved in science, technology, engineering and math (STEM). SpaceIL’s VP Education Sari Brosh Rechav said The Little Spacecraft aims to inspire children to think differently about the STEM subjects and to nurture their dreams. Written by StellarNova cofounder “Dr. Mom,” The Little Spacecraft is available in all major online bookstores including Amazon. Other resources for children are available here. Serial entrepreneur Galit Zamler’s K-12 curriculum instills business skills along with independent and positive thinking, perseverance and teamwork. You don’t need straight-As to be successful in life – just ask high-school or college dropouts like Bill Gates (Microsoft) or Sir Richard Branson (Virgin Group). And you don’t need to come from a wealthy family – just ask Oprah Winfrey or Ralph Lauren. But you do need to learn some business basics, and in Israel there’s an enrichment program called Entrepreneurship for Kids (EFK), approved by the Ministry of Education, for starting this process as early as kindergarten. Developed by Israeli serial entrepreneur and mother of four Galit Zamler, EFK offers a curriculum introducing younger children to entrepreneurial skills in a fun fashion, while finding and fostering each child’s personal strengths. For older grades, EFK offers ready-to-teach modules on different aspects of entrepreneurship leading to group projects conceived and developed by the kids for presentation at a year-end fair. Under the guidance of teachers trained by Zamler, pupils in participating schools go through the same process that adults do in business accelerators: identifying needs and opportunities, defining a target audience, writing a business and marketing plan, and creating and pitching a proof of concept. One third-grader named Yair had the idea of an adjustable t-shirt inspired by the sci-fi movie Back to the Future, where the hero pushed a button enabling him to enlarge or shrink his clothing. Yair’s EFK group went to visit Israeli fashion designer Rotem Eyal – who had spoken to them during Global Entrepreneurship Week – to learn about the business side of fashion, and worked with a student’s mother, a bridal studio owner, to sew a prototype. A fifth-grade EFK participant, Itai, learned to look at his classmates as potential customers to be dazzled, honing his public-speaking skills to the point where in ninth grade he launched a YouTube channel that now has over a million views. Polished presentation doesn’t come easily to many children. Zamler recalls one seventh-grader too shy to talk about her startup idea to her peers. But later in the year, she was the one to volunteer to explain the class business project to a delegation of educators visiting from a developing country. Sponsored by Israel’s MASHAV Agency for International Development Cooperation, such delegations come to see EFK in action twice a year. Two additional school systems from developing countries that found EFK online are trying to raise money to buy the program, says Zamler. EFK also has been adopted by the Hebrew Academy in Miami Beach, and a company from Hong Kong franchised EFK from Zamler. This year during Global Entrepreneurship Week (November 12-18), about 14 schools in the EFK program will hear guest entrepreneurs talk about their challenges, difficulties and successes, “so the children will understand it doesn’t happen in a minute,” says Zamler. Starting EFK didn’t happen in a minute either. Its history dates back to 2009, when Zamler’s son’s grade-school principal in Ramat Gan wanted to launch an afterschool entrepreneurship club 10 years ago. But the educational service she consulted wanted to charge a steep price and accept only outstanding students. “I wanted to reach many more kids, especially those whose parents are not aware of the benefits of this kind of activity and cannot afford high fees,” says Zamler, who has a master’s of business administration.However, the club didn’t survive the arrival of a new principal the following year. So Zamler tried running it at the local community center, only to find that those who signed up were exclusively boys from well-off families.“I went to the principal and explained that I was an entrepreneur and I was willing to run the course voluntarily,” says Zamler. And she did, to great acclaim by kids and parents. She realized she needed to bring the program back to schools. “I did it for six years voluntarily because I really believe in this,” Zamler tells ISRAEL21c. Until late 2014, she made time for EFK alongside her work with her husband in launching a series of startups – two of which (Ada2C++ and Live Dist) achieved success. Just before the 2014 Global Entrepreneurship Week in November, a principal in Herzliya contacted Zamler about starting an EFK program. When Zamler said she was too overwhelmed with existing sites, the principal persuaded Zamler to stop volunteering and make a new career out of inspiring the next generation of Israeli entrepreneurs. Zamler no longer leads EFK clubs personally. She develops lesson plans containing activities, questions and videos, and trains teachers chosen by each participating school to run the sessions. “When teachers are being trained in entrepreneurship, they also acquire skills that are important to everyone today in a rapidly changing world,” Zamler points out. “It’s not just about business and money. Education for entrepreneurship fosters independent and positive thinking, identifying opportunities, having faith in yourself and your abilities, defining goals and objectives and persevering until they’re achieved, taking responsibility, and developing creativity, teamwork and interpersonal skills. Fun and easy, for the entire family. In tall glasses (or parfait cups), layer yogurt then a topping, yogurt then a topping, yogurt then a topping. It looks too good to eat. This can also be fun at a party. And for the more industrious and slightly older children, what is better than pizza? Everyone loves pizza, kids especially. I think my son would eat it every night if I would allow it. Here is a basic recipe that older kids can make themselves. All ages can participate in spreading the sauce and sprinkling on the toppings. In a large bowl, proof yeast in water. You will see it bubble up – this is fun for everyone to watch. Whisk in olive oil and salt. Stir in flour, 2 cups at a time until dough is no longer sticky. Knead until smooth – 5 minutes at the most. Drizzle olive oil around bowl. Roll dough in oil until coated. Cover bowl with a towel and let rise until doubled – about 1 hour. Divide dough in half and roll into balls. Cover and let rise for another 15 minutes. Sprinkle cornmeal over bottom of pizza pans. Shape dough to fit pans – stretch and flip and pretend you’re an Italian chef. (Or just put it on a lightly flour surface and keep pushing it out) Now you are ready to put on the toppings. We like a sauce-less pizza with feta cheese and mozzarella. Or cover with pizza sauce, then mozzarella cheese (or pizza cheese) and the toppings of your choice. We have a lot of fans of plain here. I like it with olives, black and green. I also like the vegetarian pepperoni. Preheat oven to 450 degrees. Bake for 10 – 15 minutes until cheese is browned and bubbly. When those terrible twos hit, many parents are unprepared for the challenge. It seems as if children are a whirlwind of activity interspersed with meltdowns and even defiance. This angers children; they can’t take all the “Nos”. Developmentally they haven’t learned how to handle frustration in productive ways, so they cry and whine and eventually meltdown. At the same time, children are learning that they are separate from their parents. They are now starting to understand that they have their own body, thoughts and feelings. They start to assert their independence. Now they need to feel in charge of themselves. This is when they start to say “Me do it!” They get really angry when they are unable to buckle themselves into their car seats, or they are not allowed to walk by themselves in the parking lot. So now that their behavior makes a little bit more sense, here are five simple ways that parents can handle these toddler years. The most relaxed parents are the ones who set themselves us for success. They know that they shouldn’t take their children on an errand at the end of the day or will skip the visit to the highly stimulating amusement park. Most children (and adults) do not work well when they are hungry, tired and overwhelmed with sights and sensations,(loud noises and bright lights). The simplest way to ensure good behavior (or at least some sort of reasonableness) from your toddler is to make sure that they are getting a good night sleep, appropriate naps and are well fed. Although it is not always possible, it’s best if you take them to a venue that is age appropriate for them, like parks, mini-amusement parks, and the baby pool. Another trigger for bad behavior is rushing. Most toddlers cannot transition from activity to activity easily. They need a lot of wiggle room. It is helpful to give children a lot of advance warnings before you need to leave home, get them into their pajamas or before putting them to sleep. Similarly, if you know your child spends a lot of time in the bath and hates getting out, make that a part of your schedule. Parents often know when a temper tantrum is coming. Don’t act surprised. Try to schedule in that inevitable meltdown. So if Eli usually cries when he has to put on his pajamas and it takes him about 15 minutes, until he calms down, schedule in that extra time during your bedtime routine. Since toddlers are experimenting with independence, they like to feel like they’re in control. Giving them choices allows them to assert their autonomy, but safely, because you, the parent, are still in charge. Choices foster a sense of self as children come to learn that their preferences can be communicated and respected. “Do you want me to buckle you or do you want to buckle yourself? These questions seem as if they can take a lot of time, but can save you hours in avoiding those toddler power struggles. Singing is also a great way to help get kids transition, “We are going to eat dinner, to eat dinner, to eat dinner….”, “It is time to leave the park, the park, the park…” Most parents, when it is time to clean up, have definitely used the clean-up song to get everyone going. This doesn’t mean that your child will stop resisting. You might have to use these phrases over and over again. However, it gives parents something to say that is kind and helpful while enforcing the rules. It often keeps parents calm and can be soothing for children. She is right. Patience is physical. I have a lot more patience with my kids if I have eaten a healthy dinner, had my multivitamin and gotten a good night sleep. As parents we can’t always do that, but we should strive for it. It should be our number one priority.